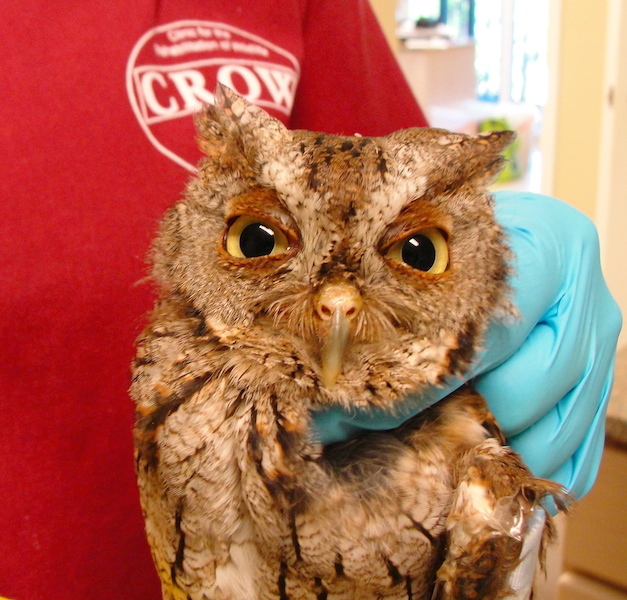 An adult eastern screech owl (16-3241) arrived at CROW from Fort Myers on October 12 with a left wing injury. It was unclear how the owl received the injury. It arrived bright and alert After radiographs identified a fractured left ulna (forearm) causing minor displacement and fractured left carpometacarpus (single fused bone between the wrist and the knuckles) show moderate displacement. Splints were placed on the injuries and physical therapy will begin early next week. Has been bright and alert (BAR) but isn't eating when mice is left in enclosure during the day. Is doing well in physical therapy and can comfortably and easily reach near full extension of left arm. The owl continues to be bright and alert all day, A callous is forming at the fracture site and is healing as expected. Splint removed, and wing placed in figure 8 for 7 days. After 7 days , the wrap will be removed and place patient outside small flight enclosure to see if it can fly. Patient is flying very well and has been cleared for release (date pending). The eastern-screech owl has successfully completed rehabilitation and has been released after flying well and maneuvering through various obstacles.